What is Itchy Ear Canal? Ears are a relatively small part of the body as compared to the others. But their size cannot overshadow the importance that they have in the human anatomy. Ears also have an equally large supply of sensitive neurological fibers as any other part of the body. The Outer ear is connected to the inner eardrum through a tube known as the ear canal. Thus, any irritation is sensed instantly by the brain through the fibers. Even though, itchiness may seem harmless and mundane; sometimes it may be indicative of underlying health issues that an individual may be subject to. Moreover, those who have sensitive ears experience such chronic itching that they may feel the urge to insert objects into the ear canal to find relief. Inserting anything into the ear canal could lead to severe problems and worsen of allergies and infections. Allergies – An infection known as Otitis Externa is more likely to develop in people who have asthma, other allergy issues or allergic rhinitis. It occurs when earplugs, sweat, ear medication, shampoo and other foreign bodies come into contact with the ear. Ear Canal Dermatitis – It refers to a condition where the skin in and around the ear becomes inflamed. It is an allergic reaction which is usually triggered off when an individual uses a beauty product containing a substance that the person is allergic to or wears earrings made of a metal that has an allergic reaction to the skin. Use of Hearing Aid – Sometimes people may be allergic to hearing aids. Therefore an allergy is experienced as soon as the device is worn. Water that may be trapped in the ears due to regular use of the hearing aid, as well as an ill filling hearing aid, could also cause an allergy. 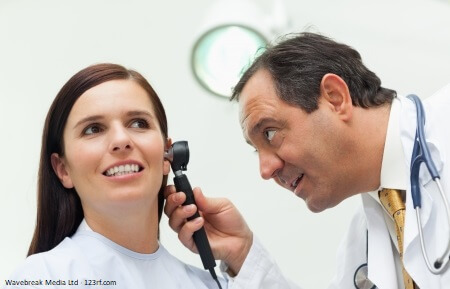 Insufficient Ear Wax – Some people cannot produce enough ear wax for their ears. It leads to the drying up of the skin inside the ears. In such cases, people are likely to observe flaking skin falling out of the ears. Psoriasis – It is a skin problem that causes red rashes on the body. Usually, it affects visible parts of the body. However, psoriasis may also appear inside or behind the ears and cause itchiness in the ear canal. Excessive Moisture – Exposure to a humid environment for a prolonged period or swimming in polluted water could cause ear infections. Excessive water can wash away ear wax making the ear dry and itchy and contact between then ear and contaminated water make the ear canal accessible to germs further causing itchiness. Ear Infection – Infection of the otitis media can lead to severe pain, swelling and redness. Other Causes – Extremely hot or cold environment, medication or stress, could cause itching in the ear canal. Severe and life-threatening reasons like anaphylaxis could also result in similar conditions. Avoid inserting objects like pens, bobby pins, car keys, etc. to scratch inside the ears. These objects allow microorganisms to enter beyond the protective layer, making it easier for them to infect the region. Using one’s fingers to scratch inside the ears is a safer alternative. People who use a hearing aid must wait for their ears to dry before they wear them. If water remains trapped in the ears, it may result in itchiness or an infection. Covering one’s ears or shutting the windows is a good practice to prevent dust, pollen, and small insects from entering the ears. Using antihistamines also helps to avoid allergies. Care must be taken to use jewelry made of metals that do not cause allergic reactions. Use of metals like gold, silver, platinum, palladium and titanium helps to reduce chances of an infection. Placing cotton balls in the ear while swimming or bathing restrict water from entering into the ears. It eventually reduces the loss of ear wax or possible chances of an infection. Cleaning the ears is important to maintain health and hygiene. Too much of ear wax can cause extreme itchiness. Thus, ears must be kept clean. Remove wax – Ear wax is meant to protect the ear against allergens and foreign bodies. However, too much of it can cause itching and pain. The affected ear can be placed upwards, towards the ceiling and a warm bottle of water or hot washcloth can be applied to it to soften the wax. Follow it up by using a cotton swab to clear the wax from the ears. Peroxide – This substance can be used to loosen the wax inside the ears. Some peroxide can be poured into the ears and allow to stay in the ears for a while. After some time the ears can be tilted to drain out the solution. Warm Oil – Instead of inserting objects to relieve itching, a few drops of warm oil can be applied inside the ear. It could be a few drops of olive oil, mineral oil or vegetable oil that could be placed in a jar of warm water. The oil is then put into the ears using a dropper after ensuring that it is not too warm. A mixture of Alcohol and Water – This mixture has also proven to be effective in reducing itchiness. It can remove debris or bugs from the ear canal. A syringe can be used to apply and withdraw the mixture from the ears. Medication – Antibiotics, medicated ear drops, steroidal topical ointment, antibiotic ointments and OTC ear drops can be used to treat an itchy ear canal. Although itching of the ear canal may seem regular, it may have underlying health causes attached to it. If regular cleaning of the ears do not prevent the itchiness and other signs of allergies or infections are noticed, a doctor must be consulted.